After suffering a 104-101 loss to the Orlando Magic on Saturday afternoon, the Toronto Raptors are now 2-14 in all game 1’s, which is the second-worst record in the NBA. Kyle Lowry has been known to underperform in the postseason, and the narrative continued in game 1 against Orlando as he scored 0 points. He shot 0-7 from the field and had seven rebounds and eight assists. The only other time that a Raptor scored 0 points in 34+ minutes of action in the playoffs was Anthony Parker on April 22, 2008 against the same opponent. Former Toronto Raptor and current Memphis Grizzlies player Jonas Valanciunas was in attendance to watch his old team in action. Reports of lightning in the building. Kawhi Leonard led scorers with 25 points and added six rebounds. Pascal Siakam had 24 points and nine rebounds. Danny Green and Marc Gasol had 13 points each, while Fred VanVleet scored 14 points off the bench. The Raptors shot 33.3% from three-point range, and only 64% from the charity stripe. All Orlando players scored in double figures, including former Raptor D.J. Augustin who scored 25 points and had an important impact on the game. Evan Fournier scored 16, Nikola Vučević and Jonathan Isaac each had 11 points and eight rebounds. Former Raptor Terrence Ross went 2-11 from the field and scored 10 points. Michael Carter-Williams had an eventful game for the wrong reasons in the latter stages. Carter-Williams caught a Kyle Lowry hand to the nose in the fourth quarter which led to a major nosebleed, and the referees did not make a call for a Lowry foul on the play. Carter-Williams then went after to the refs to complain about the non-call before going back to the locker room to receive treatment. He told the media that he was okay during a post-game interview, and tweeted that he will be good to go in game 2. "Nose is a little sore, but I'm OK."
Augustin was the hero in game one for Orlando, hitting the game-winning three. Historically, the Raptors respond well in game 2s after losing the first game in a playoff series. 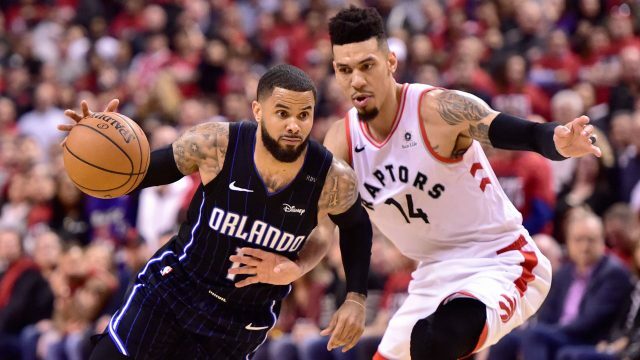 Game 2 vs. the Orlando Magic tips off at 8 p.m. on Tuesday at Scotiabank Arena.